This artist's concept shows how NASA's Mars 2020 rover will look as it explores the Red Planet. NASA has unveiled some cool new concept art for its next Red Planet robot, the Mars 2020 rover, and it looks awesome. Both rovers are about the size of a Mini Cooper. But the 2020 rover will have a completely new mission, NASA officials said. "The mission takes the next step by not only seeking signs of habitable conditions on Mars in the ancient past, but also searching for signs of past microbial life itself," NASA officials wrote in a statement. "The Mars 2020 rover introduces a drill that can collect core samples of the most promising rocks and soils, and set them aside on the surface of Mars. A future mission could potentially return these samples to Earth." 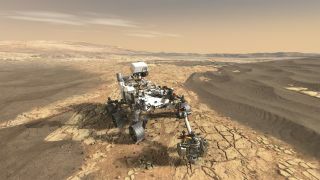 NASA had previously released art depictions of the Mars 2020 rover. But the new concept art is the first detailed look at how the rover might look on the surface of Mars. Past images showed the rover with its many science instruments labeled, or on a white background. NASA scientists are currently evaluating three potential landing sites for the Mars 2020 rover. Those regions on Mars include Jezero crater, an ancient delta carved by a past lake basin; the Columbia Hills, the site of past mineral hot springs that was previously explored by NASA's Spirit rover; and Syrtis Major, an ancient shield volcano. The Mars 2020 rover is scheduled to launch in July or August of 2020 aboard a United Launch Alliance Atlas V rocket from a pad at Cape Canaveral Air Force Station in Florida, NASA officials said.